As you move the slider on the left, the point on the parabola moves. 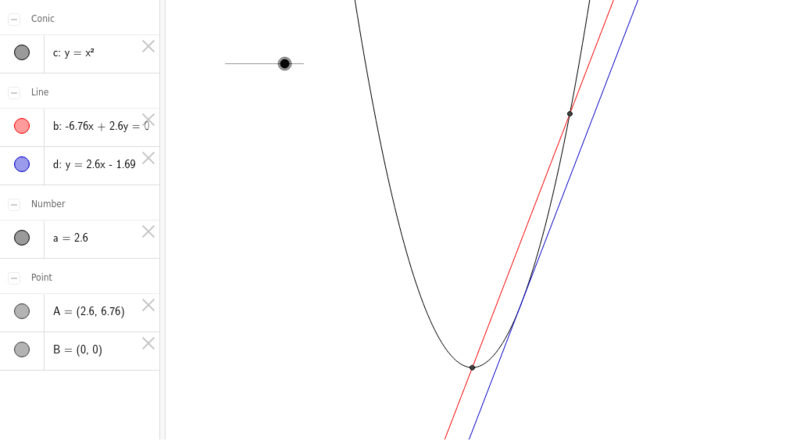 As the point moves along the parabola, the red line that connects the vertex to the moving point, called a secant line, is also changing. The blue line is called a tangent line because it touches the parabola at one point. 1.How is the red secant line changing? 2.What is the relationship between the red secant line and the blue tangent line? 3.How does moving the point in either direction affect the relationship between the red secant line and the blue tangent line? 4.Explain what happens when the point moving along the parabola approaches the vertex from either direction.